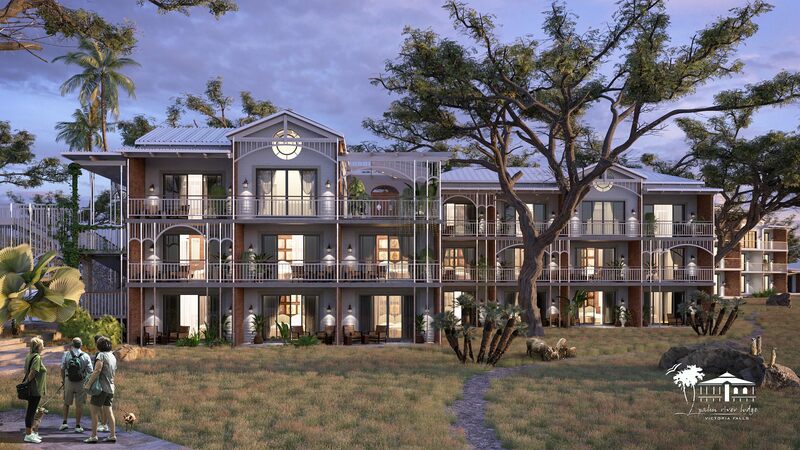 Ilala Lodge Hotel Group has commenced construction of a new luxury hotel on the banks of the Zambezi River, Victoria Falls, following a Groundbreaking Ceremony held last week. The 4-star luxury hotel will be named the Palm River Lodge and marks a significant expansion to the Ilala Lodge Hotel Group.Welcoming the construction of the Palm River Lodge, were honorary members of council, including the Honorable Minister of State for Provincial Affairs, Matabeleland North Province, Honorable CDE. Richard Moyo and the Mayor of the Municipality of Victoria Falls, Cllr Dhlamini. Inside reflects a modern, natural and stylish elegance, with 73 generously-sized deluxe guest rooms, a luxurious presidential suite, two honeymoon suites and two private villas. The Palm River Lodge will also offer a relaxing spa, state-of-the-art gym facilities and an outdoor swimming pool. The hotel will present two unique dining experiences, including indoor á la carte fine-dining and outdoor dining on the banks of the Zambezi River. Guests may also delight in luxury river cruises onboard the Ra-Ikane River Cruise, owned by the Ilala Lodge Hotel Group.